Well, you KNOW I love birthdays and today it happens to be mine :)! If you’ve followed me for a while you know my birthday is a time for celebration. As life has been a bit busy these days due to so many reasons which I will post later so we didn’t plan a lot this year. We are going to dinner tonight with my brother’s family, AS’s uncle’s family and his cousins. It is planned to be a simple day. 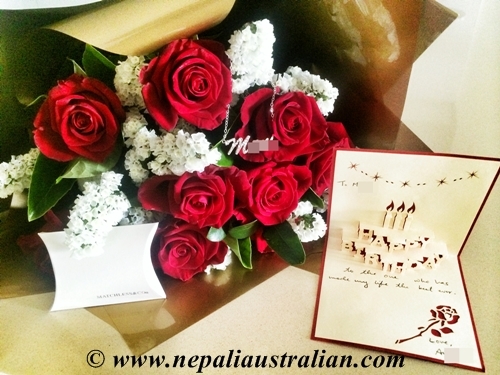 I loved the red roses and the necklace is just lovely. 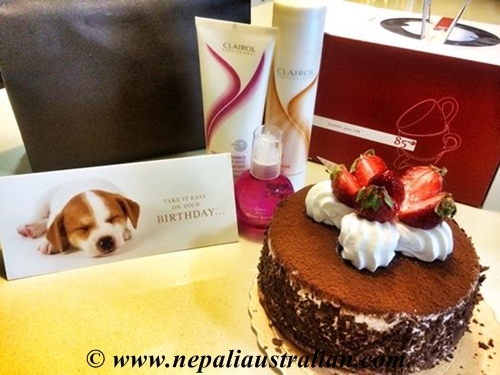 I also received a yummy cake and gifts from a lovely friend along with many messages and Facebook posts from families and friends around the world. 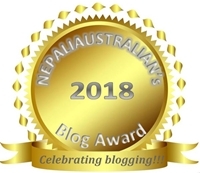 This entry was posted in Celebrations and tagged another year older, australian, birthday, birthday celebration, birthday surprise, dinner, facebook., food, Happy Birthday, Nepali, nepali australian, Nepaliaustralian. Bookmark the permalink. A very happy birthday to you! You are one day before my brother, not that it matters, just thought I’d throw that out there! Happy Birthday M. God bless you and keep in your same energy level throughout your life. take care. Whoah ! This is the 3rd time already ! Time does fly so fast, doesn’t it? Anyway Happy Birthday !. Happy birthday! Wishes for a year full of joy and blessings! Love the beautiful photos!